This has been excerpted and adapted from a longer review that was originally published under the title of "Guenevere and Godiva" in the Times Literary Supplement of 8 July 2015. Some long quotations, page numbers, illustrations, captions and links have been added: click on the images to enlarge them, and for more information about them. As a garnering of already-published pieces, Victorian Poets is not a big publishing event. Yet its samples of the very "Newest New Criticism" from a constellation of scholars from both sides of the pond and the gender divide, and from that divide's convergence in Q Theory, make inspiring reading. Cunningham introduces the essays with his usual panache as: "Now [sic] re-readings and re-interpretations — contentious often (and often contended) — driven variously by contemporary ideological interests, including especially gender questions, selfhood and body issues, compelled too by recent textualities promoted by structuralism, post-structuralism and deconstruction" (1). Perhaps a little presumptuously, the word "Now" at the beginning echoes his previous book's title, Victorian Poetry Now: Poets, Poems and Poetics, from the same publishers in 2011 [Review]. There he spelled out the fact that, consciously or otherwise, and simultaneously, we read both in our own "Now" and the poets' "now." Cunningham certainly took both "nows" into account in that vigorous and encyclopaedic take on the poetry of this whole long, prolific and diverse period. In this new book, the "Now readings and re-readings" reflect similar interests in what he calls the "greatly afforced canon, women, homosexuals, regional and working-class poets" (1). But whereas non-specialists could enjoy the earlier book, with its zest and many close readings, and its effort to avoid jargon, this one in its variety of approaches is more for the already clued-up, the specialists. It is a "Critical Reader" aimed at the critical reader. This is a moving piece, as humanistic as it is analytical. 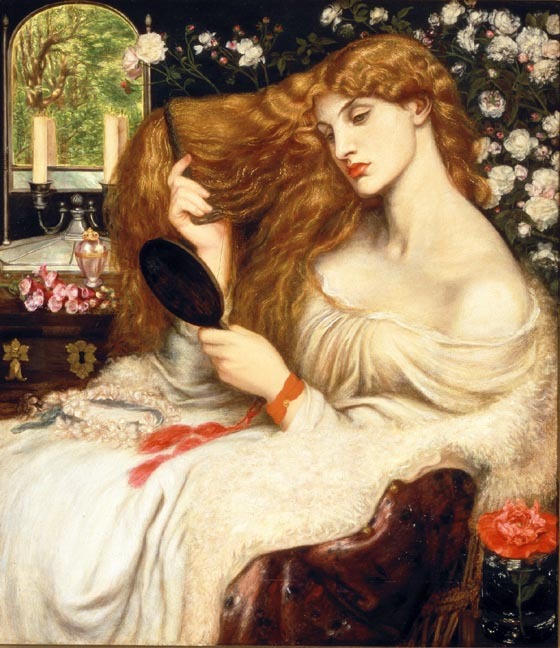 Dante Gabriel Rossetti's Lady Lilith, with a hand-mirror and a mounted mirror in the background. All credit to Cunningham too for the intelligent ordering of these essays. The book opens with two accounts of textual mirroring and echoing. The first, by the Derridean Gerhard Joseph, delves into the mysteries of "the death-and-rebirth pattern" (18) and "representation theory" (21) in Tennyson particularly, seeing the "The Lady of Shalott" as seeking "a windowed release from Romantic self-absorption to solipsism" (21). This ideal start leads on nicely to Hillis Miller's consideration of Dante Gabriel Rossetti's use of mirrors in both poetry and art, as fine an example as any promised in Cunningham's introduction, of the way theory is brought to bear on text, so that readers are alerted to new potential meanings, new ways to respond, and new ways to formulate their responses. Mirroring is not an easy subject to talk about lucidly, but "The Mirror" itself and other poems are analysed so that each truly "shimmers" (Hillis Miller's verb, 34) with possibilities – not just of doubling but of distance, difference, separation, loss, and so on. "My discussion must be brief and incomplete", says Miller, giving a clue to the fascination of his subject by adding, "because there would be no end to the labyrinthine wanderings of the critic who attempted the absurd task of the topographical mapping of all the 'ways and days' intricately interwoven in this topos of the memorial threshold, widow, or glass" (38). Some such idea comes through too in Howard F. Tucker's "Dramatic Monologue and the Overhearing of Lyric," with more emphasis on textuality but the same awareness of the current need for that "intersubjective confirmation of the self" that comes from over-hearing (88), and interpreting, indeed recreating, uniquely for ourselves, the meaning of what is overheard. Tucker's concluding words here are: "textuality is only the beginning" (90). Nowhere is there a greater sense of the Zeitgeist, the changing philosophical current of the times. 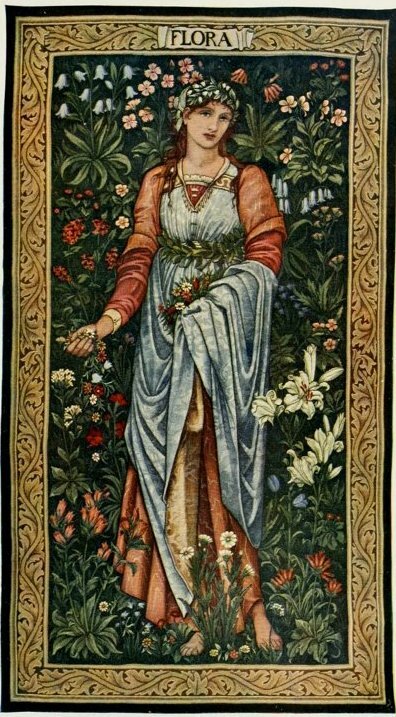 Flora, with the figure designed by Sir Edward Burne-Jones, the mille-fleur background by J. H. Dearle; manufactured by Morris & Co. This change, of course, affected just about everything. The "New Radical Aesthetic" is presented by Isobel Armstrong in an essay with that title, subtitled "The Grotesque as Cultural Critique." Paradoxically, in view of the subtitle, this inspired the winsome cover design with its two little details from a Burne-Jones and Morris tapestry. Again, as throughout, theorised reading gives way to a fresh "sense of fact" (qtd. from T. S. Eliot, p.162), of focused attention to detail, and above all of engagement, just as Cunningham claims that it so often does. In a particularly wide-ranging discussion we are shown, for instance, how the "taboo on overt reference to sexuality is everywhere broken" in the subtlest ambiguities of poems like "The Defence of Guenevere" (129). Ruskin features largely, and here, as in the preceding essays, the "education of the eye" that he advocated does indeed appear, in Armstrong's words about him, the "essential democratic need" (139) — an essential tool for the critic, too. After a provocatively politicized view of Hopkins in a lecture by Geoffrey Hill, and Cunningham's own piece, the book moves on to rather easier territory, with marginalised working-class women, whose poetry, presented by Susan Zlotinck, simmers with suppressed energies under the domestic yoke, or reflects the challenging movement away from it. Like the other themes mentioned in the introduction, the following essays help to explain other well-known phenomena like the Victorians' preoccupations with hair, abundant or (in Christopher Rick's marvellous riff on the subject of what this might mean) just differently coloured; bodily preoccupations; death and mourning; and the religious turmoil of the day. As for the last, with the same zest as his editor, Eric Griffith balances his own ever-edgy response to others' readings of Christina Rossetti's verse with rather more compelling ones, concluding with an appreciation of "Ascension Day," where he likens the waiting apostles to Victorian travellers at one of the great new railway termini, a little absurd as waiting people are, with their "whistlings, pretended absorption in a time-table, and restlessness. From which it does not follow," Griffiths adds, "that the beliefs which keep them waiting are absurd" (312). Humorous in ways to which we can all relate, but at the same time sympathetic and strangely moving, this is "now" re-reading at its very best, not simply humane but (suitably enough in this context) elevating. Every piece here deserves close attention, either sending us back to familiar poets as keener, more "active" auditors, or introducing others promoted only recently by new trends in criticism. Here, for example, are the lesbian co-authors Katherine Bradley and Edith Cooper, compositely known as Michael Field, searchingly analysed by Chris White as they find ways to express their defiance of social norms: "My Love and I took hands and swore / Against the world, to be / Poets and lovers evermore..." (qtd. p.376). Cunningham also gives space to poets who have gone out of fashion, such as Algernon Swinburne, whom Timothy A. J. Burnett shows definitively to have worked much harder at his craft than usually supposed. Sadly, though, no one stands up for George Meredith, whose gusto and evolutionary faith would have made a bracing corrective to the Victorians' obsession with death. In his previous book, Cunningham mentioned Meredith among the major Victorians slighted by F. R. Leavis, and it is a shame that, like Walter Savage Landor at the beginning of the period, this nineteenth-century figure with a rafter-raising laugh has been omitted here too. 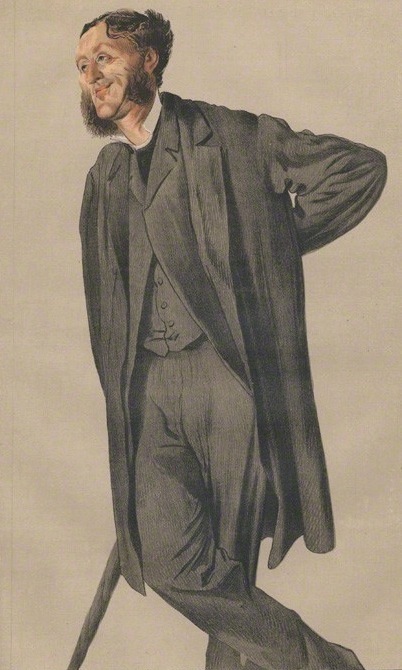 James Tissot's caricature of Matthew Arnold for Vanity Fair, 1871. However sharp the focus, many of Cunningham's contributors are Professors Emeritus or Emerita, and in a position to make the occasional big and sometimes surprising generalisation based on a lifetime's teaching: "I now think," opines Dorothy Mermin, Professor Emerita from Cornell, after concluding her gender-bending essay on "The fruitful feud of hers and his" (a quotation from Swinburne's "Hermaphroditus") with a discussion of androgyny in Arnold, "that in some important sense, all the Victorian poets, male and female, can be read as women" (217). In the context of Arnold's and others' discomfort with their roles as poets, this makes a good deal of sense, and in Arnold's case finds particular support in Joseph Bristow's controversial Q-reading (if that term can be used) of "Dover Beach" as a poem imbued with regret about the loss of his and Clough's Oxford companionship. Whether you agree with it or not, a certain general view of Arnold as not simply dandyish but womanish, nostalgic for the intense loyalties of his academic past, gets another airing here. Much to enlighten, then, and much to absorb — and much to provoke "now" readings of our own when we go back to familiar texts with new eyes, or explore texts that have been newly brought to our attention. Valentine Cunningham, ed. 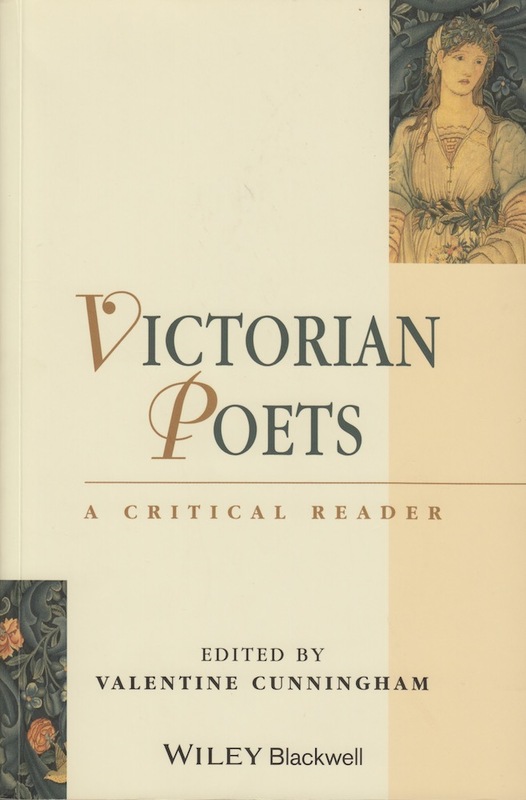 Victorian Poetry Now: A Critical Reader. Pbk. Malden, USA; London; Chichester: Wiley-Blackwell, 2011. xii + 430 pp. 978 0 631 19914 4. £29.99.